UPDATE 21:57 ACDST: Telemetry received shows flywheel working and Landing gear deployed. Everything appears to be working. 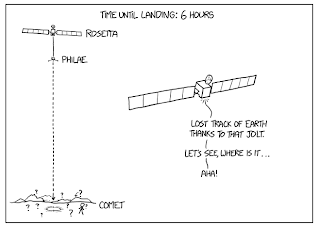 XKCD's wonderful cartoon of Philae leaving Rosetta and heading for comet 67P, the cartoon updates so every time you visit there will be a different image of the journey. Philae has separated from Rosetta and is heading towards the comet. Until the lander and Rosetta are lined up properly we won't have any telemetry, the first telemetry should be at 12:00 UT (that's 11 pm AEDST). BREAKING NEWS! Telemetry acquired from @ESA_Rosetta and @Philae2014 !! WOOT! The ony problem has been the nitrogen thruster that was supposed to hold the lander down as the harpoons and ice screws deployed has apparently failed. Unless the surface is rally solid, this should not be a problem. Everything else seems to be working fine. The lander is heading towards Comet 67P/Churyumov-Gerasimenko at a leisurely 2 Km per hour, it should arrive at the landing site in around 5 hours at 3:00 am AEDST (16:02 UT).